A brand spanking new product line is available for you from Design Essentials. 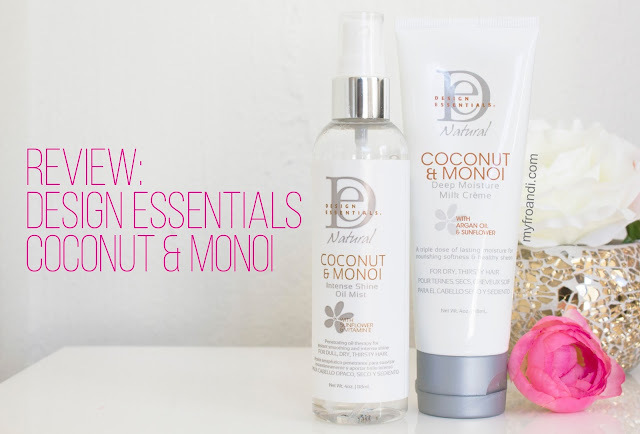 The new Coconut & Monoi collection promises to be a solution for dull, dry and thirsty hair. In South Africa, the line consists of the Deep Moisture Milk Crème, Intense Shine Oil Mist, Coconut Water Curl Refresher, Deep Moisture Oil Treatment and the Deep Moisture Milk Soufflé. It’s all sulphate free and paraben free. Along with the other Healthy Hair Gurus, I was lucky enough to try of some of the products from this collection. The Intense Shine Mist’s ingredient list contains Moroccan Argan Oil which promises to instantly sooth dry and brittle hair. The formula is packed with protectants that help to protect curls from damage and to add radiant shine but warns not to be used if you have fine hair – not a problem for me! My two cents: I was surprisingly happy with this mist. I say that because I’m not usually a fan of oil products, I don’t see them giving me more shine or doing anything else beneficial for my hair and I also don’t like their smell. I loved this one. The instructions say to mist it evenly onto damp or dry hair. I used it both ways to help seal in moisture after washing my hair and it also works beautifully on my dry hair. The scent is sweet and fruity but not overwhelming. My 4C hair always looks dry, even if it’s not so when I used this mist I was really happy that it gave Fro that healthy looking sheen. I still use this today as a finishing product, especially when I create an updo, to stop my hair from looking dull and dry. The consistency is also great, I like that it’s a mist rather than in an applicator bottle which I just find messy. 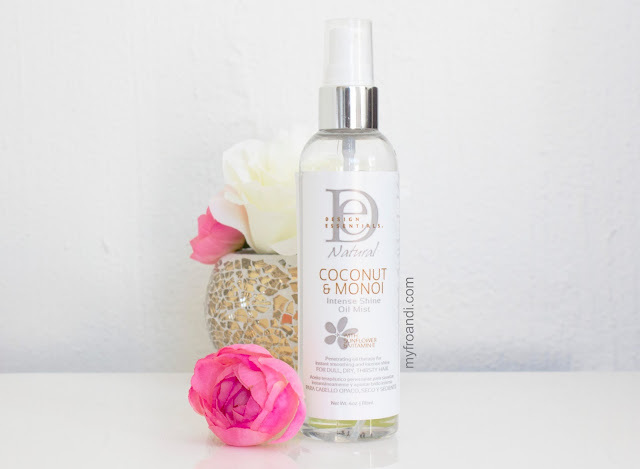 As a mist, it doesn’t trickle down my face but stays in place on my hair – very ideal! This crème promises to revitalise curls in just minutes without weighing them down. It’s also being punted as ideal to use to refresh older styles such as 2 or 3 day old twist outs whilst minimising frizz. 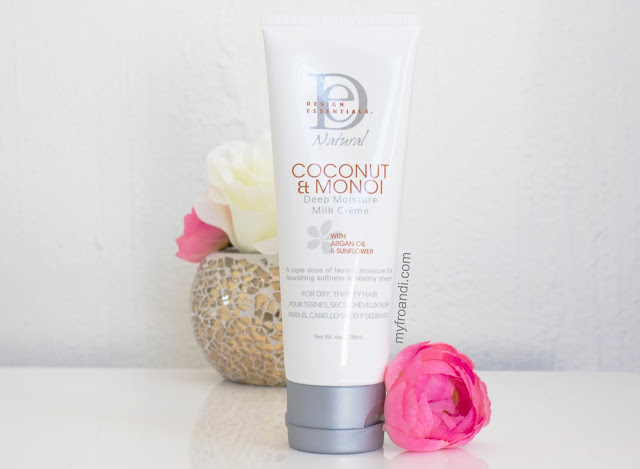 My two cents: I was really excited to try this product because I’m always looking for lotions that I can use daily to help Fro get into a “styleable” state. So, I used this crème in two ways to see the difference in results. I firstly used it the way they instructed: squeeze a small amount into hands, rub together and smooth through damp or slightly misted hair for even distribution. This method didn’t work for me because my hair shrinks so much as soon as water touches it. The other way I used it was to put it on my dry hair instead, in the mornings after unravelling my bed hair. It loosened my hair nicely but my hair still shrank a lot and it was also frizzy by midday. At first, the scent was a bit too strong for me. It’s very sweet and I usually shy away from that kind of strong scent but once it was on my hair, it softened so it was more bearable. The consistency is a thick creamy texture, so it’s in between a thick butter and runny lotion consistency. Because of this, I wasn’t expecting it to shrink my hair as much as it did. Granted, there is water in the product (first ingredient) but I thought it would refresh my twist out without shrinking it so much. I wouldn’t have a problem if my hair shrank but it still had defined curls and was moisturised, but it didn’t feel that way with this crème. Overall, for my hair this was an okay product. As the collection promises to treat thirsty hair, I think it could have been more moisturising. My hair, especially in dry Joburg, is always thirsty. Ingredients: Water (aqua), Isopropyl Myristate, Polyquaternium 32 (and) Mineral Oil, Glycerine, Cocos Nucifera (Coconut) Oil, Dimethicone, Cocos Nucifera (Coconut) Oil, Gardenia Tahitensis (Tiare) Flower Extract, Tocopherol, Helianthus Annuus (Sunflower) Seed Oil, Argania Spinosa (Argan) Oil, Hydrolyzed Milk Protein, Quaternium 80, Phenyltrimethicone, Polyquaternium 11, Olea Europaea (Olive) Fruit Oil, Polyquaternium 7, Cetyl Triethylmonium Dimethicone Copolyol Olivate, Phenoxyethanol (and) DMDM Hydantoin (and) Iodopropynyl Butylcarbamate, Fragrance (Parfum), Calendula Oil Extract, Tocopheryl Acetate (Vitamin E), Citric Acid, Coumarin, D’Limonene. My South African readers, Design Essentials is locally available and you can buy your stash straight from their website and also on Niche Hair Care’s site. For reviews on the rest of the Coconut & Monoi collection, have a read of my fellow hair gurus thoughts; Wisaal, Tendayi and Kavuli. Aw man. Can't use any of these. I have fine hair and shrinkage is. . .well, shrinkage. Oh well. The hunt continues. Coming out of that closet gave me R300 weave money to spare! Yay! That blog post was sort of a wake up call thanks to you. Thanks Mvumikazi. I'm glad you've come out of the closet! Freedom!! !